Below is another electrifying speech by Björn Höcke, a rising star in the new AfD party in Germany. The eloquence of his words shines through even for those who don’t understand German. Anyone who lives in the formerly free (and now multicultural) West can identify with the national sentiment that Mr. Höcke evokes, and wish that the same sort of voice could be heard speaking out in his or her native tongue. The love of one’s own people has long been cultural anathema in Germany. If Björn Höcke is any indication, that unofficial prohibition is now melting away as a result of the Great Refugee Crisis. Many thanks to Rembrandt Clancy for the translation, introduction, and subtitling. We are our own people! We must protect our country, we must protect our state and we must protect our Volk against the policies of the old-parties. And this task suits AfD considerably…. the AfD is the last peaceful chance which our country has, dear friends. On 7 November, Gates of Vienna introduced a new personality in the German peoples’ resistance to her own abolition, as Thilo Sarrazin called it. 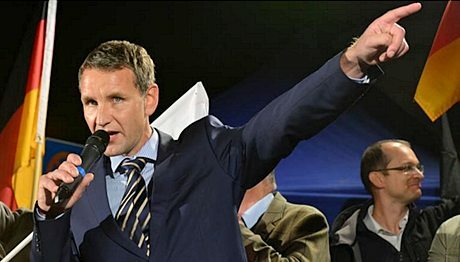 He is Björn Höcke, parliamentary faction leader for the Alternative für Deutschland (AfD) in the state legislature of Thuringia and spokesman for the AfD in that state. Since September, Mr. Höcke and the Thuringian AfD have been organising demonstrations against the German government’s asylum policy. The video shows Björn Höcke’s speech of 18 November 2015, the last of the almost weekly AfD demonstrations to take place before Christmas in Erfurt. The usual environment for these events has been the darkness of Cathedral Square, where the neo-Catholic Bishop, Dr. Ulrich Neymeyr, turns out the Cathedral’s lights. This time, however, due to another event, the demonstration was displaced to the grounds of the Thuringian state legislature. Previous demonstrations in Erfurt have thematised “asylum chaos” and betrayal by the elites; but for this one, the organisers changed the theme under the shadow of the co-ordinated Islamic attacks in Paris on the previous Friday; in this speech, Mr. Höcke draws a direct connection between the attacks in Paris and the uncontrolled influx of “asylum” seekers, precisely defying the “urgent plea” of the interior minister, Thomas de Maizière (NDTV English). Mr. Höcke also makes public a series of five basic principles, which he worked out jointly with Dr. Alexander Gauland, the faction chairman of the AfD for Brandenburg, who presented them at a simultaneous demonstration in Magdeburg in Saxony-Anhalt where 2,000 participants are reported to have attended. The first basic principle is “Germany is not negotiable”. According to MDR-Thüringen, which presents a fairly objective report of the event, the police estimated the number of participants in the demonstration at 3,500 and the number of counter-demonstrators at between 350 to 500 people. An impression of the atmosphere at the event may be viewed in the video provided by MDR-Thüringen. “Wir sind Wir” (lit. We are We”, but here translated as “We are our own people”) is an expression Mr. Höcke uses at the outset of his speech to express his emphasis on restoring Germans’ confidence in themselves as a people, whom he deliberately addresses using the word the politically incorrect term, “Volk”. MDR-Thüringen shows Mr Höcke singing along as the song is played over the speakers at the demonstration. Wir sind Wir was released by Paul van Dyk in 2004 and it is sung by Peter Heppner. Not without interest are the lyrics, which contain paradox and images of transformation and resurrection related to German post-war experience, but fixed in a materialistic setting. These are not fully expressible in English translation. The big problem is that Germany, that Europe, have lost their masculinity. I say: we must rediscover our masculinity, for only when we rediscover our masculinity will we be resolute, and only when we are resolute, will we be able to mount a defence, dear friends. Wir sind wir! [We are our own people] dear Friends. Dear friends, you know what the big problem is? The big problem is that Germany, that Europe, have lost their masculinity. I say: we must rediscover our masculinity, for only when we rediscover our masculinity will we be resolute, and only when we are resolute, will we be able to mount a defence. And we must be able to mount a defence, dear friends. Dear friends, Paris has become the European capital of terrorism. And like me, you too are horrified. I know that. But at the same time, I also wonder whether the tears shed by the German and European old-party politicians could really be genuine tears. Genuine tears can only be shed, by the one who has done everything to prevent a misfortune. Dear friends, there was the murder of Theo van Gogh 2004 in the Netherlands; this year already dozens of hand grenades were detonated in Malmö in Sweden; and most recently, the terrible terrorist attacks in Paris. These are the consequences of a decades-long, failed immigration and asylum policy, dear friends. More than ever is our demand justified, — and the previous speakers also substantiated that in all clarity — the influx to Europe must come to an end immediately. And precisely because of the background of the terror attacks in Paris; and because of the policies which might now be expected from the old-party politicians; more than ever, dear friends, I must warn: we Germans must not allow ourselves — through the actions of manipulated people incapable of independent and responsible decision — to be drawn into wars, which are not our wars. Our Germany is facing a national emergency, for our Germany is already a failed state. It is the small events, it is the everyday events of the past weeks which have happened everywhere and in every location of our republic. Small events, which the media hardly notices at all, but which are still a clear indication that we are in the middle of the failed-state phase. The judiciary, dear friends, has here capitulated to the inaction of the politicians, and the police WILL soon capitulate. And to prognosticate that, one truly does not have to be a prophet. A further example, a quite small, everyday event, which perhaps you heard about: Last week fifty asylum seekers were supposed to have found a new home in a communal accommodation in the Erfurt Warsbergstraße. Twenty of them did not wish to move in, because they considered the accommodation — a former office building customised especially for them — as unsuitable. It took a few hours before our completely overextended police, who really have other things to do… — At this point, an enormous, heartfelt thank-you to our officers, who are today once again doing magnificent work. Thank you for affording us protection. — It took hours before the police were able to persuade most of them to move into their quarters anyway. But five of them refused tenaciously. They spent the night in the entrance to the underground garage of the former office building. By the next morning, the five asylum seekers had disappeared; five, in addition to the three hundred thousand in this country, who are not registered; who, in some locales, present with highly contagious diseases; and, isolated cases perhaps too, but nevertheless highly active diseases. With disquieting intentions they are underway in Germany on this very day. Dear friends, that is an unmistakable sign of a failed state. The AfD speaks as the only political force to publicly address this problem and fight for the preservation of our country. Dear friends, those who have spoken before me have already emphasised this, but I will say it once more in conclusion: Merkel, Federal Chancellor, Dr. Angela Merkel: you have forfeited your right to continue leading the German people. We need a new Federal Chancellor [female]. We need a new Federal Chancellor [male], and he can only come from the AfD, dear friends. It is beyond description, the fact that the formerly venerable Social Democratic Party of Germany is discussing in all seriousness making Heiko Maas a candidate for Chancellor. Kindly name me someone who is a bigger political flea than Heiko Maas, dear friends! That poor little man! No Angela Merkel, no Heiko Maas, that poor little man, no Bodo Ramelow sits in one of these cafés that was fired upon in Paris. These rulers do not sit there. Defenceless, dear friends, sit there only the Volk; sit there only the ordinary citizens, sits there only the little man; it is only we who sit there as a rule. We are expected to lie in the bed, which the old-parties have made for us. I call out to the old-party politicians — and a few of them may also be listening in right now from our venerable parliamentary building, and I have even heard that today we have a livestream broadcast of the demonstration — to you old-party politicians now sitting at the television listening to my speech live, — I call out to you undistinguished Ladies and Gentlemen: we will not listen to the slop which you serve up for us; we have not ordered it and we are now sending it back. With slogans of appeasement, those in authority cover up their inaction; but words are words, dear friends, and deeds are deeds. But there are deeds. Indeed, there are in fact the deeds on the part of those who govern, but these deeds, dear friends, these deeds cause the alarm clock in me to ring, and perhaps also in you. “It is absolutely necessary, that in the face of the danger of terrorism from Islamists — and — right-wing radicals, that we strengthen our secret service personnel”. Dear friends, since anyone who still utters the term “Volk” — and I do it unflinchingly and with self-conscious deliberation and with much delight — is stigmatised as a right-wing radical — we must assume that the dissatisfied Volk themselves are to be the object of monitoring: GDR 2.0 — I know which way the wind is blowing; that is all I have to say to that. Greetings to our friends from Berlin who are also here. Were the borders perhaps opened; perhaps opened, deliberately opened, or were they deliberately kept open, in order to bring about chaos? And is our ossified representational party democracy perhaps to be translated into an authoritarian order? No, we do not wish to strengthen any conspiracy theories here. Only to those governing, you undistinguished Ladies and Gentlemen, you old-party politicians, I call out to you: in case you harbour such thoughts, forget that right now! Here stands das Volk, here stands the vigilant Volk; and if you do not hold a referendum at the federal level, then we will do that. We citizens no longer have confidence in the politicians. We are dis-illusioned with the government. But that means also that we will no longer allow ourselves to be given illusions. Dear Friends, there is no other course: we must protect our country, we must protect our state and we must protect our Volk against the policies of the old parties. And this task suits AfD considerably. And I say it here yet again, and I have already said it often, but I must continually put this credo into the public sphere: for me, the AfD is the last peaceful chance which our country has, dear friends. Indeed it is for this reason as well, that I built up this party with such great hope, and with so many idealistic people who have stood beside me. And because for me, the party is the last evolutionary opportunity, the last peaceful chance for our country, I would like right now to give to our party’s five basic principles to take with them. These basic principles are the joint work of my colleague and AfD faction leader in the Brandenburg Landtag, Dr. Alexander Gauland, and me. Alexander Gauland will be reading aloud at this moment these five basic requirements, these five principles, simultaneously, at the large AfD demo in Magdeburg, dear friends. Out state, our nation, is not a product of chance. It is the work of so many generations. With pride, with pride we look upon a rich culture, civil and political freedoms and prosperity. We are willing to help many countries in this world. But one thing we will not do: hand over our land and our nation. Germany is our country, dear Friends! Germany is not a laboratory for social experiments. We reject irresponsible experiments with and on our Volk. Only ideologues believe that a society without a family can function, or that everyone becomes a German as soon as he has crossed the frontier. To the dangerous ideologies which aim to create a multicultural society and abolish the classical family, we issue a clear refusal. Germany must act along the lines of self-determination. Germany, in the estimation of the highest ranking security officials, is no longer in a position to guarantee her domestic and external security. The situation is spinning out of control. And what is the Bundeswehr doing? They are serving foreign interests throughout the world, while the soldiers who remain here evacuate their barracks for asylum seekers and repair toilets in reception centres. We require, finally, a political leadership willing to make independent decisions in the national interest. Germany must win back her domestic freedom. Not infrequently, the so-called “Lügenpresse” [lying press] as many call it, have earned their name honestly. In the place of objective reporting, they propagate a fatal welcoming culture. The state television, financed by the TV-licence fee, brand us as adversaries, because we say what is not supposed to be said. Political correctness lies like blight on our country. The AfD is the guarantor of free speech and of the unsparing analysis of our situation. Because we have gathered here today, the domestic freedom in Germany is still alive. Germans must become capable of responsible self-determination [mündig werden]. And Erfurt, the capital of courageous citizens, is the place to speak out once and for all with the utmost clarity: Germany, dear friends, Germany was the homeland of our forefathers. Germany must remain the homeland of our children. Germany is our homeland — our land — and our nation! This entry was posted in Civil Liberties, Counterjihad, Domestic terrorism, Enrichment, Europe, Immigration, Islamic Atrocities, Media, News, PC/MC, Politics by Baron Bodissey. Bookmark the permalink. How could anyone not insane disagree with what he said? You are using a double-negative. Could you clarify what you want to say? Possibly a triple-negative, depending on how one reads it. All the passion of an ordinary German but none of the arrogance of a demagogue. He is close to tears at time. Not a great natural speaker but he is so evidently ‘Everyman’ and not some hate-filled Nazi as the media has created. Germany: a failed state. Terrifying words. The EU is a failed state. It was designed that way. I like that he opened his speech with a call to the German men, to wit, to gird up their loins, in a manner of speaking. The world needs men with chests, as C.S. Lewis describes them. Men who will lead as fathers, as elders, as citizens. Resolute men of the volk. There is yet another basic principle, and a very nasty one too. Are we prepared to watch those who attempt to blackmail us with their lives and well being in order to enter our countries illegally, die of starvation and exposure at our borders? So yes, this wave of migration is founded on blackmail, and if we close the gates in their faces, vulnerable people will die. Are we mentally tough enough to watch this happen? There is no ‘nice’ way. People must be held solely responsible for the consequences of their own folly. And though I hate to say it, temporary concentration camps are the only option. The British had this problem when trying to keep Jewish survivors of the Nazis out of ‘Palestine’ in 1935 -1948, They built Atlit and other camps in Cyprus and Mauritius. Nice. Pretty much German paleocons. Five basic principles are very sound. Rock solid rejection of kulturmarksimus. If only they can avoid the tea-party trap of selling out to the 1% …. The “TEA party trap of selling out to the 1%”?!? What planet are you on, or are you just [epithet redacted]? It was, and is the TEA party BEING SOLD OUT *BY* the 1% of the RINOs in th GOPe. Yes, a great speech and good allusion to one of my favourite music videos (linked under the words “Wir sind wir”). That said, IMO the problem is that Bjorn Höcke is an “Ossi” in Thuringia, a part of the former East Germany. Where are all the “Wessis” – those from the free, capitalist and culturally enriched West Germany? Is the cultural enrichment so wonderful, that so few of them protest what’s happening? Or are there other factors at play? Have West Germans been so frightened by years of indoctrination about racism, and threats from Antifa, that they stay silent, on the pain of the risk of losing their jobs, their friends and perhaps also their families? Whatever the reason, if Pegida, AfD and others hope to stop the madness, they need to win over not just the politically-incorrect East, but also the vastly bigger and more powerful West Germany. Import shiploads of non-indigenous rats. Release them in huge numbers in cities. The enemies of free speech such as the BBC will sneakily leap on every remark by anybody. I am not saying they are not brilliant, they are, but if you read the novels of Jane Austin you will find that she is centred in a life which is divorced from poltiical life. It is as if she is saying that the personal is some way divorced from the political. However today the personal is political and the political is personal. But for that to be expressed requires a decisive battle against everything that the BBC stands for. The German station mentioned may be very like the BBC but the BBC with its utter sneakiness is on its own in this regard. Why is the BBC so sneaky? because the BBC represents a culture (British Empire gone, British Imperialism hanging on to US Power and to Jihad Power both incidentally now joined at the hip) and that BBC culture is exposed as both useless and dangerous. He speaks for many in Europe. Thank you for the sub titles. As a Jew I am still “rattled” by a German nationalist in full flow. I can concentrate on the speech via the subtitles and not be disturbed. May I take a moment to address your concerns? It’s true that Hitler and the Nazis were associated with German nationalism and racial identity. They embarked on their suicidal wars of expansion using this rationale. And yet, in the end, it turned out Hitler was simply using the words to pursue his own aims. The real objective of Hitler’s actions was to immortalize Hitler. The concept of German nationalism was used (and discarded) to achieve this end. You recall that by the end, Hitler gave orders to destroy the entire infrastructure of Germany: bridges, roads, factories..everything. He intended a more complete destruction of the German people and nation than even the most revenge-besotted Russians could imagine. And why? Because the GERMAN PEOPLE LET HITLER DOWN BY LOSING THE WAR. Hitler was taking revenge on his own people. The real German nationalists were the resistance, the White Rose, the plotters who tried desperately to gain Allied support to depose Hitler, stop the insane genocide, and resist the Russian invaders. I don’t think Germans have to be ashamed of a real German nationalism, nor do non-Germans need to fear the assertion of genuine German self-interest. Without the insane megalomania of Hitler or Muhammad, German nationalism will closely resemble Swiss or Hungarian nationalism: “leave me alone and I’ll leave you alone”. In the end Hitler wanted all of Germany to go down in death and flames because Germany ‘betrayed’ him and did not deserve ‘his genius’. I fail to see the parallel in simply saying that Germans are a people (volk) i.e. they are German and they are people. That there IS something real called ‘The German People’ is self evident or there could not have been a reunification between East & West. As a Jew you should be more rattled by he millions of psychotic Arab Muslims flooding into Europe at Merkels invitaion. She is as deranged and dangerous as Hitler ever was. The nationalism is/was no threat, but the Socialism, and with it the idea of the ends justifying the means is always a prelude to horror. Hitler lied to, and deceived the German People, he was a charismatic but mendacious leader the like of whom can be seen in history, both ancient and modern, he too covered up his shady past and his foreign heritage. Wonderful! Why are people just sitting on their hands in Germany, regain your masculinity as this gentleman quite rightly says. Yes you will be accused of being right wing, extremist, islamaphobic, racist by the press and the old parties but treat these as compliments, they are losing the argument and they know it. The Coudenhove-Kalergi plan was alluded to in this speech (deliberate open door policies leading to chaos) Merkel is an adherent to this plan. Email your TV Channels, your press and politicians and I guarantee you NONE of them will discuss it or reply to you. Google it and you will see that this invasion was pre-ordained by the political elite. At what point does a generally in denial screen gazing non Muslim humankind look up and take notice that the bubonic plague has been and is being released. Perhaps only one more serious election opportunity before this goes off like bad food. By the time we notice the lymph nodes swelling – it will be too late. No atheists in the trenches is as true as it has ever been – imagine. He has a big target on his back. A brave man! Opinion polls everywhere are showing people don’t want this invasion. The governments KNOW very well their policies are not popular – they simply don’t care. Because they have the power, they think they will be able to brazen it out – and they will, until the frequency of terror attacks move beyond their ability to contain them. Then, all hell will break loose. Every day I am shocked to know that Merkel, Obama and their traitor supporters are still breathing. If the West were Africa, they’d be long gone! How long can Democracy last when the elected politicians are trying to destroy it. The one really big problem any German has, is, of course, getting out from under the shadow of WW II. It is very sad – and, today, extremely damaging – that a 1,000+ year history is completely ignored while 12 years are constantly held up to supposedly represent the brand ‘Germany’. Most people in Germany and Austria (and, to a somewhat lesser extent, also in the Netherlands and the Scandinavian countries) live in such abject fear of being called ‘racist’ or ‘right wing’ that they are apparently willing to sacrifice absolutely EVERYTHING, including their culture, countries and their children’s and grand-children’s future -assuming they haven’t already aborted all of them. This man is just looking out for his nation, he has been branded as an extreme right winger and a demagogue by the liberal establishment. Europe must turn to the Right.